Hi MWP brides! I have got a fabulous treat for you today! When it comes to wedding venues in India, Aamby Valley pretty much tops the list. It’s iconic, luxurious and yet very romantic, and this wedding is proof. At MWP, we have covered more than 60 real weddings and as wedding bloggers we have come across plenty others, but I’m yet to see a wedding this gorgeous! Here’s Ankit and Chandni’s spectacular wedding at Aamby Valley captured artfully by Aanchal Dhara Photography. Their wedding themes are bright and beautiful! The decor is eye-popping! The wedding venues are striking! And the bride and groom are utterly gorgeous! This is definitely a must-see opulent meets classy chic Indian wedding that you can’t afford to miss! To say we’re obsessed is kind of an understatement!!! 1) For a bride whose wedding wardrobe has it all- from Pallavi Jaikishen to Manish Malhotra to Sabyasachi to her stunning wedding lehenga designed by Anjalee Arjun Kapoor- We loved Chandni’s philosophy on her gorgeous wedding dresses. She wanted to wear the dress, not let it wear her! Way to go girl! 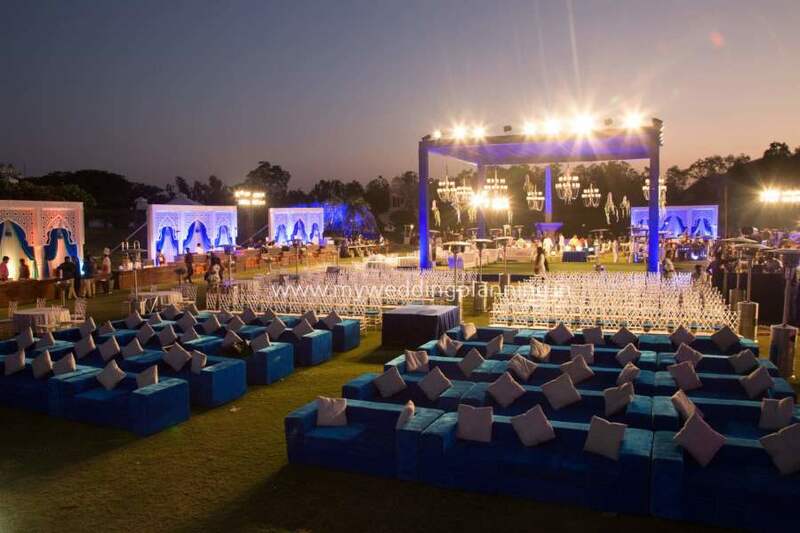 2) A wedding this grand- and yet, the couple planned it all themselves instead of relying on a wedding planner! That takes a lot of guts (and efforts)! Plus, we absolutely loved the creative wedding themes and jaw-dropping decor. 3) The invitation card was amazing as it had a video invite on a tablet given to all the guests. Wow! 4) I know I’m ga-ga about Chandni’s wedding attire. But I have to add by saying I adore her taste in bridal jewelry as well! Look at those stunning maang tikka’s she adorned for her pre wedding functions – one with pearls for her mehendi, another with emeralds, a diamante one for her sangeet and a matha patti for her wedding. She’s such an inspiration for brides-to-be! Ankit and Chandni’s wedding was all about royal charm and modern elegance. Set against the breathtaking backdrop of Aamby Valley, this wedding is exactly the fun themed, flower-filled celebration you’d imagine. 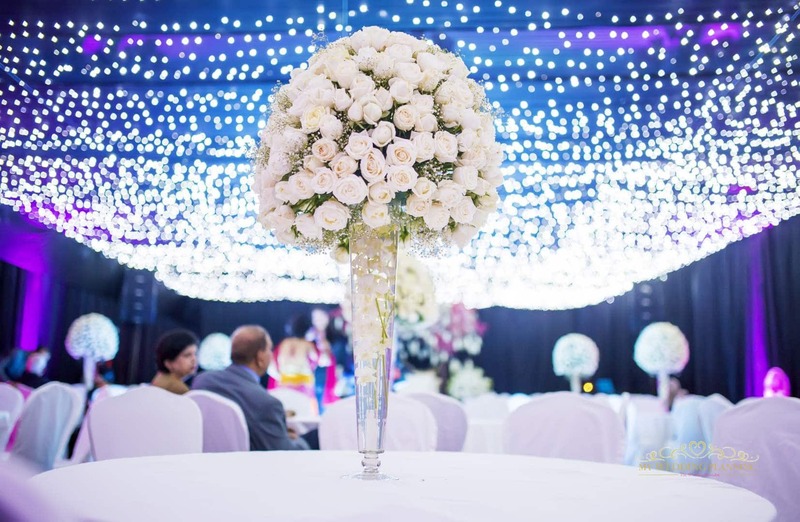 Proceeding to the spacious grassy ceremony area decorated in white and overflowing with floral arrangements, Ankit and Chandni celebrated in style with an English styled wedding before their traditional wedding the next day. Guests were dressed in white outfits. The beautiful bride, accompanied by her father, was adorned in an exquisite white and gold gown. Guests watched the bride and groom recite their vows while their dog was the ring bearer! Chandni and Ankit truly accomplished their wish: to have their friends and family feel comfortable and have lots and lots of fun at their wedding. No doubt, everyone had an amazing time, a day that they will never forget It’s a fairy-tale wedding and the very talented wedding photographer Aanchal Dhara brought every stunning design detail to life. Our team at MWP is honoured to be part of such a beautiful wedding. We sincerely thank the wonderful couple for sharing their wedding with us. Our wedding was opulent and traditional. We had colour schemes for each event. Cocktails being blue pink and purple, Sangeet was Red black white, wedding was completely traditional and royal with heavy reds and golds. For the white wedding we had a beach carnival. With blues and yellows. I enjoyed planning the clothes, décor, flowers, drapes, entertainment, even the designing of the card was amazing as we had a video invite on a tablet given to all the guests. We loved your wedding outfits. You looked stunning! I researched a lot about my wedding attire. But since I was a child I always wanted to wear red on my wedding day as I felt that was the colour a bride has a right to wear on her wedding. Like its meant for her only. I also had a white wedding on the day before my wedding. Where I wore a beautiful white and gold gown again rightful colour for an english bride. I wanted to be very simple with hair and make up. Because I believe that after 30 years of seeing my pics at the wedding I want to still look the same. And not hideous and completely bizarre. So mickey being obviosly the best in the industry gave me that look. He is known for his simplicity and class. I remember the white wedding, where we exchanged our extremely funny vows and my dog was the ring bearer. I also remember by sangeet where me and ankit danced. And lastly the moment of truth when ankit filled my head with sindhoor and made me wear the mangalsutra making me his forever. How did you choose your photographer? Did he/she deliver to your expectations? I saw Aanchal Dhara’s work online and really liked her a lot. Though at that time she had just started out , but I had confidence in her abilities. I was a very detail oriented bride. In my white wedding I could have focused on more details. I also suggest to new brides that now there is a huge influx of these upcoming designers so don’t be in the race to just buy big designers lehengas which I did. Go for very trandy styles, cuts and colours. They make you stand out on your special day. Jewelry is very important according to me. You should have a right balance of matching and contrast. Don’t overdo with wearing all your heirloom jewels. Mix and match and see what fits best.